Fly Fishing is getting Hot! Spring is springing! Finally. What a long cold winter it’s been. But for the most part I believe it’s behind us. I think the fish are feeling that way too! Bull Shoals is giving up some real nice fish. I had the pleasure of fishing with AGFC’s fisheries biologist Paul Port the other morning, and he connected with what can only be described as an exceptional smallie! We had to to do a bit of searching, seems the fish moved from where they were the day before. Imagine that huh, fish moving. Have you ever heard of such a thing? Sometimes though that makes it all the sweeter. With the spring rains, the lake has come up few feet to 657 and change, and with more rain coming it should be up a bit more soon. That makes for great fishing. The main lake temperature has come up from 40 to 47 in the main lake, and back in the creek arms I’m seeing high 50’s during the afternoons. The water is just starting to cover the buck brush in the back of the creek arms, giving the fish a little cover. The fish are taking advantage of that cover too. Walleyes, spotted bass, largemouths, smallies, and even jumbo carp are heading to the back of the creek arms in search of that warmer water. And with the water just covering the base of the brush, casting for these fish is a breeze! You can move pretty fast too because your fishing such shallow water. The cool thing is you can tie into just about anything this time of year. Everything wants that warmer water! You never know just what you hooked into until you see a little color. There can be some real pigs in that mix too! Every spring produces at least a handful of 20 pound fish, and twice that number in the 8 to 12 pound class! 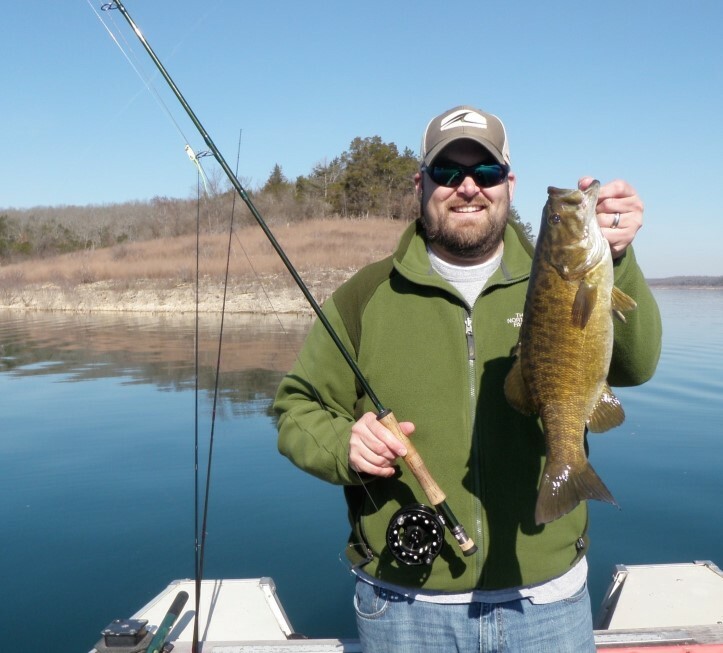 Spring is definitely the time to be on Bull Shoals. What you need to keep in mind is that you need to keep moving, because that’s what the fish are doing,,,moving. When the water warms during the day the fish move shallower, but when it cools during the night they can move right back out again. Not only that, not all the fish move at the same time. They migrate from the main lake in in groups, some move back quickly while others take a slower approach, lingering on structure along the way. So just keep moving until you find the fish. Primary points, secondary points, creek arms, and especially the back of creek arms, all of it can hold trophy fish this time of year. Sink tip lines will surely be doing the brunt of the work, but make sure to have a full sinking line with you as well. When the water gets to depths over ten feet you need to switch to the full sinking lines. Clousers of just about any color will do the trick, especially fishing slowly in deeper water. When I get into the shallower water requiring a much faster strip, I switch to flies with a softer tail such as Artic Fox or Temple Dog. The long wavy fibers of that type of fur really adds a lot of action to the fly! So if you’re sitting on the fence, wondering when you should book a trip for some fantastic spring lake fishing action. It’s now!